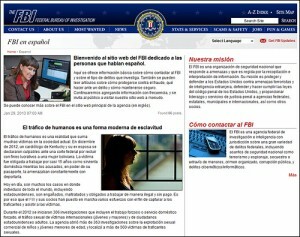 The FBI’s efforts to reach out to Spanish-speaking residents for help fighting crime appears to be working, the FBI announced Tuesday. Two years ago this month, the bureau launched a Spanish-language website on www.fbi.gov. Since then, the site has been viewed more than 160,000 times, according to the FBI. The bureau has posted stories on the site that it believes would help reduce crimes against Spanish-speaking residents. Stories included human trafficking and scams against the elderly. Posted: 1/30/13 at 8:42 AM under FBI, News Story.